Over my career I am sure I have easily had over a 1,000 photos printed in various publications, but this is a pretty proud moment – to actually see a story! If my high school English teacher, Mrs. Foster, was still around to see this she would be shocked! Yes, I went to a small school where I only had one English teacher. You see, I seem to have some aptitude for photography, but when it comes to writing, it has been a long struggle. I did not like English class in high school and frankly paid little attention. Probably because of this, I have never enjoyed the writing process. Well, a number of years ago I made a conscious effort to improve my written communication. Beginning this blog around the same time I believe has also helped with my writing. 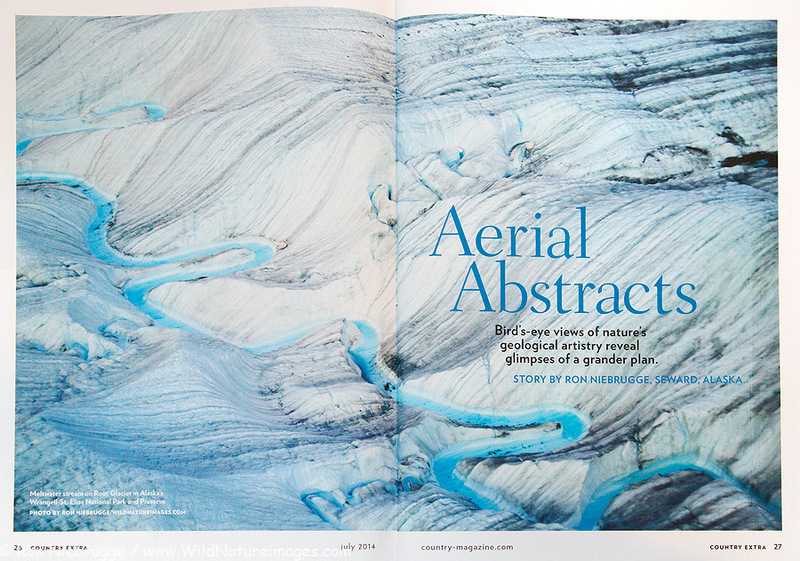 But, I never envisioned a magazine actually asking me to write a story as Country Extra did – they were looking for an article on aerial photography, something I have done a lot of! Whoops, ended a sentence with a preposition, still improving. 🙂 So I nervously went about writing and submitting my final article and was looking forward to feedback, but never heard a word. I reminded myself that I rarely get feedback on photo submissions, it makes sense that articles would be the same – magazines are all business. But, it must have been adequate as to my pleasant surprise, it showed up in the July issue along with a number of images! Kennicott Glacier, Wrangell-St. Elias National Park, Alaska. Last week I made a quick trip out to the the Copper River Valley, Glennallen area which is the gateway to Wrangell-St. Elias National Park. I was out there to give a commencement speech at my old High School. It was a great experience – really a lot of fun. It appeared the whole town was in attendance supporting the 16 seniors, that is one of the great things about small towns. 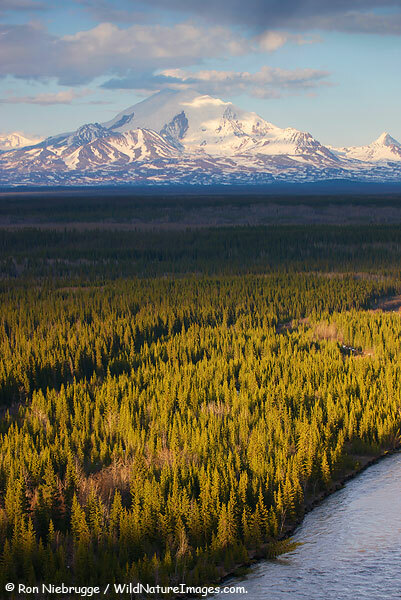 Mount Drum, Wrangell-St Elias National Park, Alaska. This was at sunset Monday night – seeing this mountain always brings back fond memories. I would often see this mountain on my drive between home and school, and it always looked different. At just over 12,000 feet, it really isn’t that tall. What makes it impressive is the vertical relief. It rises over 11,000 feet from the banks of the Copper River where I’m standing to the summit. I had a short, but very fun trip out to Glennallen. I think the commencement speech went well, and I was able to briefly see all kinds of old friends. I also saw a surprising amount of wildlife including a beautiful fox and a mink – but didn’t get any photos of those guys. Can you imagine living in the bunk house in this amazing location! And this was well before the days of Gore-tex, polypropolene and bunny boots. 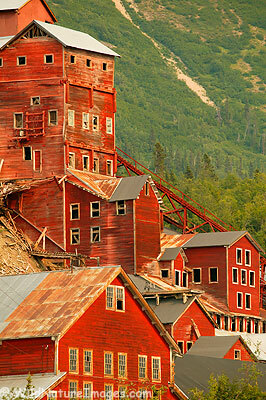 I grew up along the border to the amazing Wrangell-St. Elias National Park. I’m really excited to be returning to my home town early next week – get this for a wonderful honor, I’m returning to give the commencement speech at my high school. I am really excited, and have been working hard on my speech. I mention this in part to share my excitement, and in part to say I probably won’t be posting anything on the blog here again until later next week. 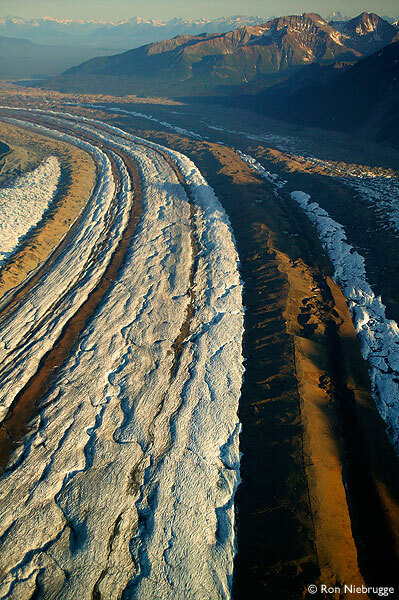 Aerial of Regal Mountain, Wrangell-St. Elias National Park, Alaska. 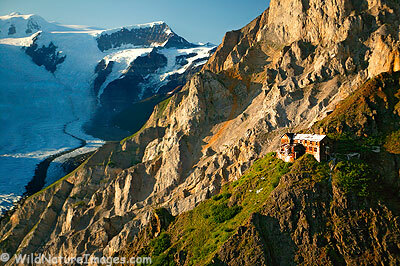 It has been a while since I have spent any time in the Wrangell-St. Elias National Park. My summer is shaping up to be a busy one, but I’m really hoping to get out that way at least for a bit, maybe this fall. This area will always have special meaning to me as I grew up nearby and within sight of the amazing Wrangell Mountains of which this is just a small part. 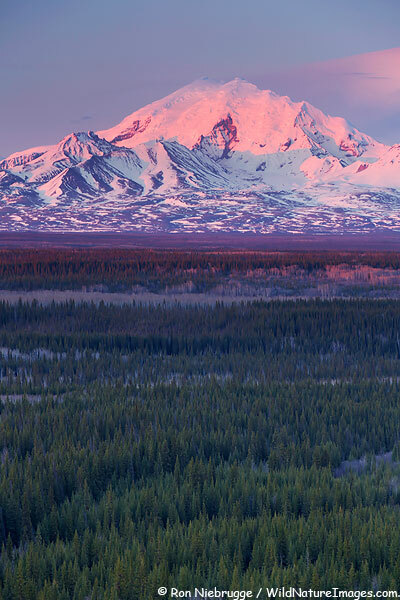 Mt Drum, Wrangell-St. Elias National Park, Alaska. I picked up a magazine assignment to photograph a fisherman in Cordova. I’m thrilled, because the timing perfectly correspondes with the amazing shorebird migration. We had a wonderful time here last year, but weren’t sure if we were going to return this year – this made that decision easy! We normally travel to Cordova via the Alaska State Ferry from Whittier, but the road to Whittier was closed thanks to a landslide. This forced us to make the long drive around to Valdez just to catch the ferry. That’s ok, it is a beautiful drive! We timed it so that we would pass through Glennallen right at sunset Sunday night so the we could photograph the Wrangell Mountains. Sunset wasn’t anything special, but the mountains sure are!